We know you work hard every day to provide great auto repair service, and the last thing you want to do is leave your online auto repair reputation to chance. 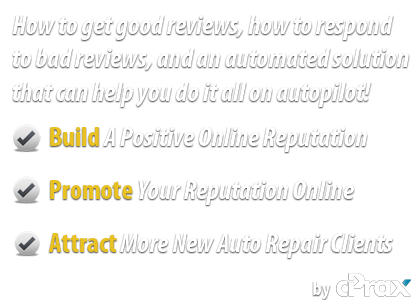 Our auto repair reputation marketing system makes it easy to proactively gather reviews and feedback from your auto repair clients to build a positive online reputation. "9 out of 10 consumers trust earned media such as referrals and reviews." We make it easy for you and your raving fans to share and promote your reviews on social media sites like Facebook and Twitter and around the web, and in your marketing efforts, tapping into the power of "earned media". Studies show that 74% of consumers trust recommendations from their social networks, and our system makes it easy to generate social referrals. Plus, when you have a positive online reputation, you will convert more leads and referrals into paying clients. "4 out of 5 consumers have changed their mind about doing business with a company based solely on negative information found online" ~ Cone Inc.